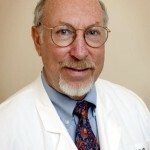 Harvey S. Singer, MD is currently Professor of Pediatric Neurology at the Johns Hopkins University School of Medicine. His clinical research interests include movement disorders, especially Tourette syndrome, stereotypic movements, and proposed autoimmune disorders. Dr. Singer’s translational research oriented laboratory focuses on the neurobiology of tics, antibody measurements in PANDAS, stereotypic movements in animal models, and autoimmunity in autism. He has been the recipient of TSA, federal and private grants and has authored multiple articles, chapters, and two books. Tic disorders, including the most widely known Tourette syndrome (TS), are neurobehavioral disorders that begin in childhood or adolescence. The primary feature of each of these entities is the presence of motor and/or vocal tics. Although these disorders are common, there remains an ongoing search for a clearer understanding of their etiology and neurobiology. The impact of tics can be quite variable, ranging from minimal to devastating, depending on their psychosocial and physical impact. Tics rarely appear in isolation. Other coexisting conditions may include attention deficit hyperactivity disorder (ADHD), obsessive-compulsive disorder (OCD), and anxiety. Behavioral disinhibition is a more significant source of difficulties than the tics. Specific pathways within the brain have been implicated (cortico-striatal-thalamo-cortical). However, the exact location and underlying mechanism remain unclear. Education of the patient and family is an essential part of therapy. There is no cure for tics. A variety of behavioral therapies and pharmacological agents and have been used successfully to suppress tics. Tic severity or impairment is not a required criterion for diagnosis. Chronic (Motor or Vocal) Tic Disorder (CMVTD) requires that fluctuating tics start before age 18, be present for more than 1 year, and individuals have either entirely motor or, less commonly, solely vocal tics. The 12 month minimum duration from time of first onset of symptoms represents an arbitrary historical cut-off point. Chronic motor tic disorder is similar to TS, only lacking the vocal tics. Provisional Tic Disorder is a newly recommended term established to designate an individual with ongoing fluctuating motor and/or vocal tics that began before age 18 years and have been present for less than one year. Tourette Syndrome (TS) aka Tourette’s Disorder (TD): DSM formal criteria for TS include an age of onset requirement before age 18 years. Most individuals, however, manifest their symptoms before the age of 11 years. Diagnosis requires the presence of multiple motor and at least one vocal tic, although not necessarily concurrently. Tics should occur many times a day, nearly every day or intermittently throughout a period of one year. The disturbance should not be the result of the use of a substance or general medical condition. Coprolalia, the use of obscene words or socially unacceptable language, is one of the most socially distressing symptoms, but is not a diagnostic criterion. Studies have suggested that only 10-19% of patients exhibit this symptom. TS is not a unitary condition, with factor analyses suggesting several different forms based on the presence of associated problems, i.e., solely tics, predominantly attention deficit hyperactivity disorder and aggressive behaviors, or primarily affective-anxiety-obsessional symptoms and self-injurious behavior. Substance-Induced Tic Disorder and Tic Disorder Due to a General Medical Condition are formal categories to replace previously used terminology such as Tic Disorder-NOS, Tourettism, Tourette-like or Secondary Tic disorders. supporting the role of the substance in causing tics drugs. Stimulants are not considered a good example since there is existing evidence that they are no more associated with tics as an adverse event than placebo or other medications. when found in association with a variety of sporadic, genetic, and neurodegenerative disorders, such as neuroacanthocytosis, Huntington’s disease, and Creutzfeldt-Jakob. Motor tics typically begin between the ages of 4 to 8 years, mean of about 5-7 years, and most before their teenage years. Simple phonic tics usually begin after motor tics, and coprolalia has a mean age of onset of 14 years. Tics have a waxing and waning course and fluctuation of symptoms are expected. Although originally proposed as a lifelong disorder, the course of TS can vary. Most patients having a decline in symptoms during the teenage-early adulthood years. Maximum tic severity tends to be between the ages of 10-12 years. Non-tic movements, including those that are drug-induced (akathisia, dystonia, Parkinsonism), stereotypies, or seen in comorbidities such as OCD, ADHD, impulsive and antisocial behaviors, need to be distinguished. The diagnosis of a tic disorder is based solely on historical features and a clinical examination which confirms the presence of tics and eliminates other neurologic conditions. There are currently no available diagnostic blood tests, brain scans or genetic screens. Non-tic movements, including those that are drug-induced or seen in comorbidities such as OCD, ADHD, impulsive and antisocial behaviors, need to be distinguished. Eye-blinking tics are thought to stem from ophthalmologic problems. Throat-clearing and cough-like tics are believed to be due to sinusitis or allergic conditions. Involuntary sniffing frequently results in referral to an allergist. Tics are characterized as involuntary, sudden, rapid, abrupt, repetitive, non-rhythmic simple or complex movements and phonations. The use of the term “stereotyped” is not favored. The reason is that the term implies a fixed condition and may lead to diagnostic confusion with another movement condition entitled “stereotypic movement disorders.” Tics are manifested in an extensive variety of forms, locations, and types. They are often considered to be fragments of a normal movement or vocal production that is misplaced and easily mimicked. Tics have differing degrees of intensity and frequency and have unpredictable durations. Both motor and phonic tics are subdivided into simple and complex categories. This construct is valuable for classification and determining impact. Simple tics typically precede the onset of more complex tics. Phonic a) Simple vocal: Simple phonations include various sounds and noises with no meaning (grunts, barks, hoots, sniffs, screeches, moans, throat clearing). Vocal tics can interfere with the flow of speech causing difficulties at the initiation of speech resembling a stammer/stutter or at phrase transitions. b) Complex vocal: Vocalizations that involve the repetition of words or phrases. Echolalia is the repetition of sounds or words of others. Palilalia is the repetition of one’s own words or phrases. Coprolalia is the use of obscene words or socially unacceptable language. In some individuals, there may be an alteration of volume, slurring of phrases, or accenting a particular word. Fluctuating course: The precise underlying environmental or biologic factor that causes tics to have significant variability (wax and wane) over short and long periods of time remains undetermined. Psychosocial stress and adversities have been implicated, since both are prominent in children with TS. However, additional studies are necessary to explore their contribution. In most patients, changes in tics are not accounted for by small stressful life events or by newly acquired streptococcal infections. Biologically, the occurrence of motor and vocal tics in recurrent bouts, which are “burst-like” and in a nonrandom pattern, has led to suggestions of a “fractal, deterministic, and possibly chaotic process” underlying the waxing and waning of tic activity. Presence in typical locations: Although tics may involve almost any external body part, most TS patients, at some time, have tics involving the face and head regions. The most common first symptom is a facial tic (eye blink, nose twitch, and grimace). Suggestible nature: Tics may appear during inquiries about specific movements or following observation of a movement or sound (echo phenomena). Voluntary suppressibility: The ability to suppress tics briefly is common. This active suppression of tics, however, is often associated with a build-up of inner tension that resolves when the tic is permitted to occur. Premonitory sensations: Premonitory sensations are sensory phenomena. They are often an urge, impulse, tension, pressure, itch, or tingle that occurs before a motor or phonic tic. These sensations are often localized to discrete anatomical regions (shoulders, girdle, hands, throat, and abdomen) and occur in more than 90% of adults, but less frequently in young children (37%). The recognition that tics may represent a voluntary response to an involuntary sensation has led some investigators to classify tics as “unvoluntary” rather than involuntary. 1) The Total Tic Score (TTS) consisting of 5 separate ratings (number, frequency, intensity, complexity, and interference) for both motor and vocal tics. Ratings are made along 5 dimensions on a scale of 0 to 5. 2) The Tic Impairment Score (TIS) representing a ranking of impairment, with a maximum of 50 points. The latter subjective component is scored based on the impact of the tic disorder on self-esteem, family life, and social acceptance. The TS Health-related Quality of Life Scale (GTS-QOL) consists of a 27-item patient reported TS-specific scale with four subscales (psychological, physical, obsessional, and cognitive). Other than the presence of tics, there are no other associated physical or neurologic abnormalities on examination. It has been estimated that only 8–12% of TS patients have no other diagnosis or psychopathology. It has also been shown that the impact of associated psychopathology is often more significant than the tics themselves in influencing quality of life. In terms of etiology, most co-morbidity, with the possible exception of obsessive compulsive disorder, is likely independent of the tic etiology. The presence of OCD, in addition to ADHD, causes additional impact on school, social and family activities. A genetic association has been identified between OCD and TS. Depression is characterized by a pervasive and persistent low mood accompanied by low self-esteem and by the loss of interest or pleasure in normally enjoyable activities. In TS, this might be explained, in part, by the presence of a chronic stigmatizing or socially disabling disorder. Whether depressive symptoms are related to the severity of tics remains debated. It is likely, however, that the etiology of depression in TS is multifactorial. This likelihood is because symptoms are also seen in patients with OCD or ADHD alone, as well as in patients receiving antipsychotic medications. Studies have demonstrated that major depressive disorder (MDD) is genetic, but that TS and MDD are unrelated. Rage attacks, difficulty with aggression, and self-injurious behaviors are common in patients with TS. Whether these behaviors are due to the presence of other disruptive psychopathology, such as obsessions, compulsions, ADHD-related impulsivity, risk-taking, or affective disorders, is unclear. Self-inflicted, non-accidental behaviors (head banging, body punching or slapping, banging oneself against a hard object, poking sharp objects into the body, scratching body parts) also occur in TS. It has been suggested that the mild/moderate form of self-injurious behavior correlates with OCD, whereas more severe forms of self-injurious behavior occur in conjunction with episodic rages and risk-taking behaviors. There is no evidence that TS patients are more likely to engage in criminal behavior than those without TS. The importance of comorbid ADHD has been emphasized. For example, diminished mathematical performance was found only in children with TS who had attention deficits. Discrepancies are reported between performance and verbal IQ scores. Additionally, impairments are noted in visual perceptual achievement and visual-motor skills. Sleep disorders: Problems associated with sleep have been reported in about 20-50% of children and young adults with TS. They include difficulties with insomnia, bedtime rituals, dreams, and abnormal sleep behaviors (parasomnias). TS patients, without comorbid ADHD, had longer sleep period time, longer sleep latency, reduced sleep efficiency, and prolonged wakefulness after sleep onset, with more time awake and less stage II sleep. Associated comorbidities, including ADHD, anxiety, separation anxiety, mood disorders, and OCD, can also be contributors to the sleep deficits. Restless leg syndrome (RLS) has been reported in up to 10% of patients with TS. Epidemiologic studies have shown that about 20-30% of children exhibit tics in a classroom setting. The estimated prevalence (number of cases in population at a given time) of impairing cases is 1-10/1,000 individuals. The prevalence of milder forms of TS may approach 0.6% of the general population. Tourette syndrome occurs world-wide with evidence of common features in all cultures and races. The disorder is more common in males than in females, with a ratio of about 3:1. Tic phenomenology and severity appear similar between children and adults. TS is common in children with autism, Asperger syndrome, fragile-X and other autistic spectrum disorders, but its presence is unrelated to the severity of autistic symptoms. The overall risks for a daughter are about 25-35%: 3-5% for TS; 10-15% for chronic tics; and 10-20% for OCB without tics. If both parents have TS and/or OCD, based on studies of only small numbers of bilineal (problems in both the mother and fathers) families, the offspring risk for a TS spectrum problem may be as high as 70-90%, TS 25-50%, and for chronic tics an additional 15%. It is emphasized, however, that although susceptibility risks may be high most affected individuals have mild conditions. Potential epigenetic risk factors (heritable changes in gene activity that are not caused by changes in the DNA sequence) that have been suggested include the timing of perinatal care, severity of mother’s nausea and vomiting during the pregnancy, low proband birth weight, the Apgar score at 5 minutes, thimerosal, nonspecific maternal emotional stress, and prenatal maternal smoking. Further replication of these latter studies is necessary before any significance can be claimed. Nevertheless, because of a suggested link between OCD and Sydenham’s chorea, the major diagnostic criterion for PANDAS remains its temporal association with GABHS. On the basis of a model proposed for Sydenham’s chorea, it has been hypothesized that the underlying pathology in PANDAS involves an immune-mediated mechanism with molecular mimicry. PANDAS remains a controversial diagnostic entity based on concerns about its defining features, clinical criterion, proposed temporal association with GABHS, role of other potential infections, inconsistently operationalized criterion, and likely missed diagnoses. Problematic laboratory support has included single-point-in-time assessments of anti-streptococcal antibodies, conflicting results as to whether children with OCD, tic disorder, or TS had a streptococcal infection in the three months or year prior to the onset of neuropsychiatric symptoms, and findings in two longitudinal studies showing that there was little association between clinical exacerbations and a new GABHS infection. In the original PANDAS cohort no individual had “overt chorea.” All except one had choreiform movements and 50% had “marked choreiform” movements. These results led some reviewers to suggest that the diagnosis was actually Sydenham’s chorea (SC). This possibility has been enhanced by the finding of overlapping biomarkers for SC and children with PANDAS plus choreiform movements. Based in part on the aforementioned, it has been suggested that tics not be considered a primary symptom for the diagnosis. In any child with the acute fulminant onset of neuropsychiatric symptoms, a comprehensive investigation is essential for the proper diagnosis. a) Neuroanatomic localization: Identification of the primary site of abnormality for tics within the brain of TS patients remains an area of active research. 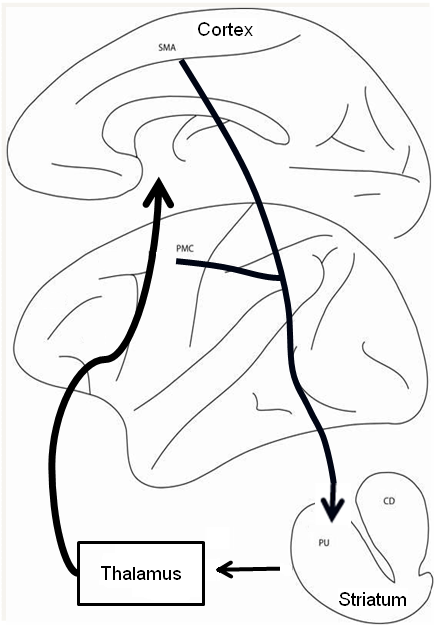 There is general consensus, however, based on both direct and indirect evidence, that pathways that run from the front part of the brain (frontal lobe) to a deeper regions (striatum and thalamus) and then back to the frontal lobe are likely involved (see Figure 1). More specifically, evidence supports involvement of the motor cortico-striatal-thalamo-cortical (CSTC) circuit which originates primarily from the supplementary motor cortex in the frontal lobe and projects to the putamen. Associations between basal ganglia dysfunction and movements in other disorders, as well as numerous structural and functional neuroimaging studies, have led some investigators to emphasize the striatal component in TS. In contrast, there is persuasive evidence to support a primary cortical dysfunction in this disorder. Lastly, some have suggested that the dysfunction lies not in these cortical-striatal circuits, but rather in other brain regions such as the midbrain, thalamus or cerebellum. As should be obvious, the specific site of the brain alteration remains undetermined. Hypotheses have included disruptions in frontal cortex, striatum, and abnormalities of various synaptic neurotransmitters. PU, putamen; CD, caudate; SMA, supplementary motor cortex; PMC, pre-motor cortex. b) Neurotransmitter abnormalities: In addition to studies attempting to understand the location of the abnormality in TS, other investigators are studying brain n Neurotransmitters are chemicals that transmit messages between brain cells across a gap (synapse). The neurotransmitter is released from the terminal of the cell sending the message (think of the release of keys), crosses the synapse, and contacts receptors (specific locks) on the receiving cell. The presence of various different transmitters within cortico-striatal-thalamo-cortical circuits (dopamine, glutamate, GABA, serotonin, acetylcholine) raises the likelihood that several transmitters could be involved in the pathophysiology of TS. A dopamine dysfunction continues to be considered a primary candidate in TS because of therapeutic response to neuroleptics, results from various nuclear imaging protocols, cerebrospinal fluid, and postmortem studies. Other implicated neurotransmitter systems in the pathobiology of TS include glutamate (a major excitatory neurotransmitter), GABA (a major inhibitory neurotransmitter), serotonin, acetylcholine, and a second messenger system abnormality downstream from neurotransmitter receptors. The diagnosis of a tic disorder is based solely on the history and clinical examination. There is no diagnostic laboratory test nor is there a requirement for the presence of any comorbid problems. Routine imaging studies should not be obtained. Input from the patient, family, and school personnel is required to determine whether tics or associated problems (e.g., ADHD, OCD, school problems, or behavioral disorders) represent the greatest handicap. Education is an essential component of the treatment process. The affected patient/family should seek clear and accurate information. For many, concise information about tic characteristics, diagnosis and outcome, genetic predisposition, underlying pathophysiologic mechanisms, and availability of tic-suppressing pharmacotherapy can remove or delay the need for medication. In complex cases, it is essential that the child receive the proper evaluation and therapy by a multidisciplinary team capable of providing appropriate diagnostic testing, educational intervention, behavior modification, counseling for the family unit, and pharmacotherapy. The decision to begin therapy should be based on the extent to which tics or other symptoms are interfering with the child’s normal development and education or the adult’s ability to function in a productive fashion. Just because a symptom exists, tics or otherwise, is not an adequate reason to initiate behavioral or pharmacotherapy. The patient and family should understand that there is no cure for tics and all treatment is strictly symptomatic. The goal of treatment is to reduce tics to a level where they no longer cause a significant psychosocial or physical disturbance. It is not to suppress all motor and phonic tic activity completely. Considering tics and individual comorbid symptoms as separate entities usually enables families and health care specialists to focus on individual needs more effectively. It should be recognized that the treatment of a child with TS requires a chronic commitment and, at times, a comprehensive multidisciplinary approach. In a randomized, double-blind, placebo-controlled study assessing relaxation techniques, tic severity was reduced in the formally trained group. However, improvement was short-lived and not significant. Habit reversal therapy is a multicomponent approach in which awareness training is used in combination with either competing response therapy (tensing muscles that are incompatible with the tic) or with the substitution of another more acceptable movement. Several small trials have previously documented the value of habit reversal therapy. Studies evaluating the value of CBIT have shown it to be equal in effectiveness to the use of milder tic suppressing medications. There is no scientific evidence to support the use of diets, food restrictions or mineral or vitamin preparations. Alternative dietary therapies have been mentioned (e.g., vitamin B6, magnesium, omega-3 fatty acids, Qufeng Zhidong recipe, and Clerodendrum inerme plant). However, there is no convincing scientific evidence to support the use of diets, food restrictions or general use of minerals or vitamin preparations. Acupuncture was beneficial in a single study, but has received little attention in the scientific literature. Preliminary studies using repetitive transcranial magnetic stimulation have been beneficial when the supplemental motor area is targeted, but had little success in stimulating motor or premotor regions. Further investigation is required. If tics have been well controlled for a reasonable period, a provider may consider a gradual medication taper during a nonstressful (e.g., summer vacation) period. Patients and families should note that, although there are a variety of medications have been shown to be effective, only pimozide and haloperidol are approved by the Food and Drug Administration for tic suppression. Several articles are available that have reviewed the extent of supporting evidence for many of the medications (see references). Clonidine and guanfacine are beneficial for both tics and ADHD. Tier 2 medications include those that act as dopamine receptor antagonists (antipsychotics/neuroleptics). Although often effective as tic-suppressing agents, medication side-effects frequently limit their usefulness. The sequence of drug selection in this category often varies among physicians. A variety of other medications including tetrabenazine and dopamine agonists have also been used. Some medications have been investigated more y than others. Dopamine agonists, pergolide and ropinirole, prescribed at lower doses than used in treating Parkinson’s disease have been beneficial but side effects can be limiting. Delta-9-tetrahydrocannabinol, the major psychoactive ingredient of marijuana, has been helpful; however, convincing evidence of its usefulness is lacking. Botulinum toxin (Botox), which reduces muscle activity by inhibiting acetylcholine release at neuromuscular junctions, has a beneficial effect on both dystonic motor and vocal tics. Multiple neurosurgical approaches, with target sites including the frontal lobe (bimedial frontal leucotomy and prefrontal lobotomy), limbic system (anterior cingulotomy and limbic leucotomy), cerebellum, and thalamus, have been tried in attempts to reduce severe tics. Nevertheless, a cautious approach is recommended pending determination of patient selection criteria and the outcome of carefully controlled clinical trials. The use of stimulants in children with tics has been controversial based on early reports suggesting that stimulant medications had the potential to provoke or intensify tics, an adverse effect that might persist despite medication withdrawal. More recent studies, however, have rejected these initial concerns. For example, several investigators have shown that the potential impact of stimulants on the development of tics is minimal or of short duration and that a definite causal effect is present in very few children. Additionally, in a multicenter, randomized, double-blind, controlled clinical trial comparing clonidine, methylphenidate, a combination of clonidine and methylphenidate, and placebo in children with tics and ADHD, results showed that both clonidine and methylphenidate were associated with significant improvement in ADHD symptoms. When treatment groups were compared for “worsening of tics,” the rates did not differ among the groups, including placebo, demonstrating that stimulants did not exacerbate tics. Alternative medications for the treatment of ADHD in children with tic disorders include the α2-adrenergic agonists clonidine and guanfacine, as well as atomoxetine, desipramine, and nortriptyline. In TS patients with disabling obsessive-compulsive symptoms, pharmacologic and behavioral modification techniques should be considered. Several antidepressant medications that are selective serotonin reuptake inhibitors, including fluoxetine, clomipramine, and sertraline, may be beneficial. Tic symptoms vary from person to person and can range from being very mild to severe. Most TS cases are mild and affected individuals lead productive lives. Long term, most studies support a broad “rule of thirds” when discussing outcome, i.e., 1/3 disappear, 1/3 are better, and about 1/3 continue as a reasonable estimate of outcome. However, in reality, only 20% or fewer may continue to have a moderate level of impairment by age 20. Although tic resolution is reported by many adults, whether they fully resolve has been questioned. There are no scientifically proven predictors of severity and longevity. The premonitory urge does not correlate with tic severity, but in older children may be related to obsessions, compulsions, and depression. Tics can be troublesome, especially severe phonic tics. However, most adults are able to cope with appropriate family and medical support. A small subset of patients have been described with life-threatening symptoms, frequent visits to the emergency room, and hospitalizations because of TS symptoms or behavioral comorbidities; these patients are labeled as “malignant.” The presence of coexisting neuropsychiatric issues has a significant effect on impairment; whereas individuals solely with chronic tics being less impaired than those with OCD, ADHD, mood disorders, etc. In adult TS patients, the main independent factors for determining health-related quality of life were depression, severity of symptoms, and age. The National Tourette Syndrome Association (TSA) located in Bayside, New York (www.tsa-usa.org) and its multiple local chapters throughout the United States are a valued resource for patients and their families. A goal of the TSA is to educate both patients and the public of the many facets of tic disorders. Increasing public understanding and tolerance of tics and TS are of paramount importance. Belluscio BA, Jin L, Watters V, et al. Sensory sensitivity to external stimuli in Tourette syndrome patients. Mov Disord. 2011;26:2538-43. Cubo E, Gonzalez M, Singer H, et al. Impact of placebo assignment in clinical trials of Tourette syndrome. Mov Disorders. 2013;28:1288-91. Cohen S, Leckman JF, Bloch MH. Clinical assessment of Tourette syndrome and tic disorders. Neurosci Biobehav Rev. 2012; 37(6):997-1007. Deng H, Gao K, Jankovic J. The genetics of Tourette syndrome. Nat Rev Neurol. 2012;8:203-13. Egolf A, Coffey BJ. Current pharmacotherapeutic approaches fot the treatment of Tourette syndrome. Drugs Today. 2014;50:159-79. Felling RJ, Singer HS. Neurobiology of Tourette syndrome: current status and need for further investigation. J Neurosci. 2011;31:12387-95. Ganos C, Kahl U, Schunke O, et al. Are premonitory urges a prerequisite of tic inhibition in Gilles de la Tourette syndrome? J Neurol Neurosurg, Psychiatry 2012;83:975-78. Knight T, Steeves T, Day L, et al. Prevalence of tic disorders: a systematic review and meta-analysis. Pediatr Neurol. 2012;47:77-90. Lebowitz ER, Motlagh MG, Katsovich L, et al. Tourette syndrome in youth with and without obsessive compulsive disorder and attention deficit hyperactivity disorder. Eur Child Adolesc Psychiatry. 2012;21:451-57. Leckman JF, King RA, Gilbert DL, et al. Streptococcal upper respiratory tract infections and exacerbations of tic and obsessive-compulsive symptoms: a prospective longitudinal study. J Amer Acad Child Adolesc Psychiatry. 2011;50:108-18. Martino D, Mink JW. Tic disorders. Continuum. 2013;19:1287-1311. McGuire JF, Piacentini J, Brennan EA, et al. A meta-analysis of behavior therapy for Tourette syndrome. J Psychiatr Res. 2014;50:106-12. Rizzo R, Guilsano M, Pellico A, et al. Tourette syndrome and comorbid conditions: a spectrum of different severities and complexities. J Child Neurol. 2014; 29(10):1383-9. Scahill L, Woods DW, Himle MB, et al. Current controversies on the role of behavior therapy in Tourette syndrome. Mov Disorders. 2013;28:1179-83. Shahana N, Gilbert DL. Tourette Syndrome. Handbook of Clinical Neurology. 2013;116:631-42. Singer HS, Gilbert DL, Wolf DS, et al. Moving from PANDAS to CANS. J Pediatr. 2012;160:725-31. Singer HS. Tics and Tourette syndrome. In Pediatric Neurology: Principles and Practice, 5th edition, Swaiman KF, Ashwal S, Ferriero DM, Schor N (eds), Elsevier, Philadelphia, 2012. pp 1009 – 1019. Singer HS, The Neurochemistry of Tourette Syndrome. In Tourette Sydrome, Martino D and Leckman JF (eds), Oxford Universtity Press, New York, NY 2013;276-300. Visser-Vandewalle V, Kuhn J. Deep brain stimulation for Tourette syndrome. Handbook of Clinical Neurology. 2013;116:251-58. Walkup JT, Ferrão Y, Miguel E, et al. Tic disorders: some key issues for DSM-V. Depression and Anxiety. 2010;27: 600-10.